This razor did have red acrylic scales and was fairly rusty when i got it but after about 6 hours of sanding 2 to make the new scales( ghost jade g10) and some time adding the thumb jimps + decorative cuts it came out pretty good even shaved with it a time or two. All the time sanding and finishing paid off because it looks great. I might need to get some of that G10 and find something to put it on haha. What a cool, old razor. Always feels nice to bring a neglected tool back to life. I still use a cut throat razor. I like the whole ritual. When I was a young lad I got the local barber to show me how to hold, use, strop and maintain one. Every time I use it I still remember his advice “……..very carefully. Remember, one mistake and you have a 4 inch cut on your face”. Anyway, good to see these old tools being restored and used. Do you have a strop? Horse hide ones are the best. Also the way you see them stropped on the movies and TV is wrong !!!! Do not pivot the blade across the strop. Lay the back of the blade on the top of the strop and wipe the blade down the strop with the edge pointing up (i.e. The edge trails the back down the strop). When you get to the bottom of the strop roll the blade over on the BACK (edge comes back away from the strop towards you) then draw the blade back up the strop. Repeat. With practice you can become quite fast. DO NOT roll/wipe the edge on the strop when you roll it over. Guaranteed to F&%K the edge. Neilau wrote: DO NOT roll/wipe the edge on the strop when you roll it over. Guaranteed to F&%K the edge. I bought one awhile back but have ended up using an electric razor more regularly because I don't have time for the whole routine in the morning. I prefer it though, the surface area of the blade makes for a much quicker shave and I like how shaving lotion/cream gathers at the spine of the blade; if I don't get a spot so well I turn the blade around and smear it back on and shave it over again. One thing an old barber told me when I was looking to buy one is that if you ever drop it and crack the thin blade, it'll ruin it forever. I accordingly use a loop made from fishing line to secure it loosely around my hand to keep it from cracking if it falls out of my slippery hand. Unfortunately i do not have a strop i use a dovo shavet with half a double sided safety razor blade which is nice the blade gets dull just pop in a new one.Maby one day ill get me a good strop and hone and fully dive into the art. Last time I tried shaving with one of those babies, it looked like I shaved with a weed-wacker. I use an electric razor. Even disposables tear up my skin. But beautiful work, and a very nice razor. i wont lie mine did to about the first 5 times now i beryl ever nick myself. Really good work on restoring that blade! I shave with a Dovo too, actually. It's kind of a rewarding hobby to go along with the curse and blessing of facial hair at a young age. 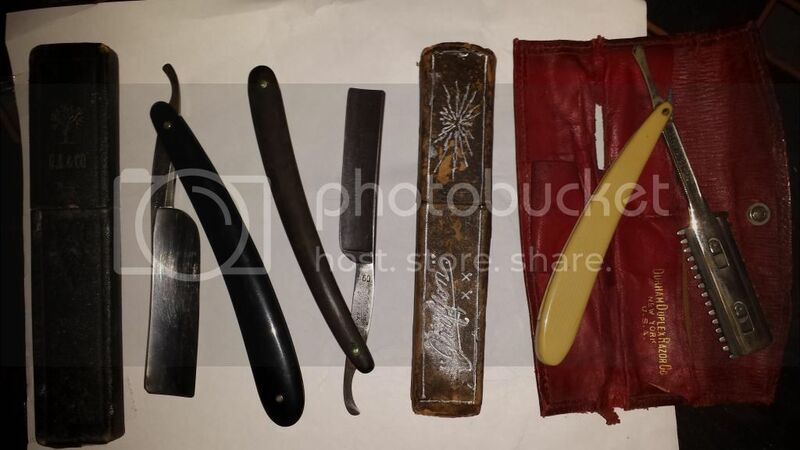 the picker wrote: Unfortunately i do not have a strop i use a dovo shavet with half a double sided safety razor blade which is nice the blade gets dull just pop in a new one.Maby one day ill get me a good strop and hone and fully dive into the art. I have a friend that makes his own, and it's actually a pretty simple process. Maybe I could have him film a tutorial for you! There's also a guy that makes some really cheap razor gear that I bought a handful of times. The stuff is fantastic quality for the price. If you email him an inquiry, he will get back to you within a day, sometimes even within hours. Really nice guy. I have one of these although I have never dared use it. scudo wrote: I have one of these although I have never dared use it. The Rolls Razor is actually pretty neat. I haven't used a cutthroat in 20 years. Although after having read this, and having a convo with Riy ,and digging up my old blades I find the urge to get into it again. I just have to find that darn strop!